Twitter silently rolled out a user directory to boost search engine efforts – but is it helping? This week, the Internet noticed that Twitter had quietly rolled out a directory of its users, though a Twitter spokesperson tells us it was actually introduced a “few weeks ago.” While this might seem like a rather small and inconsequential feature, it’s yet another sign that Twitter is hell bent on evolving into a media company and pushing its ad revenue strategy; it’s one more way to get eyeballs on the propriety Twitter site, and instead of just competing with third party developers, this time Twitter is trying to work its way around Google. Back in January 2012, Google came under fire for favoring Google+ results in its social search feature and cutting out data from Twitter and Facebook. The effort that users had put into surfacing their Twitter and Facebook accounts — inarguably the most important social profiles there are — was immediately buried when Google flipped the switch. Regardless of the history between Google and Twitter, it’s in Google’s best interest to its users as “a search engine’s ultimate goal is to give people what they want,” says Dan Eng, Senior SEO Strategist for Red Bricks Media. What this means is that you can now search for general topics like “fashion” or “presidential debate” in a search engine, and you may find tweets from relevant and preferential Twitter users showing up in the search results. Or if news breaks, Twitter hopes that search results will offer relevant tweets. And in addition, of course, is the full user directory Twitter has published that should help index many Twitter accounts with all search engines. Twitter confirmed as much when we asked about the new directory. A spokesperson told us it was released, “to help people find the accounts they’re looking for with various search engines. Public and protected accounts are included.” The spokesperson emphasized that protected tweets will remain private to the user and accepted followers. If you’re logged out of Twitter, you can access its directory from the bottom of its homepage, to the left of Twitter’s copyright mark. Opening up the page will present to you an index of Twitter accounts listed in Latin and non-Latin character names listed by the name that you’ve signed up on Twitter with (not your Twitter handle). Interestingly enough we’ve found that the directory limits the number of pages you can visit (or calls you can make) within a restrictive time frame. When we opened up more than five pages within the directory in a span of a few seconds (not links to individual Twitter accounts), we were greeted with a blank page on the sixth page. The rest of the site work was working as intended. From the directory, I was able to find my own Twitter account, @francisybea under “Francis Bea,” as well as my colleague Molly McHugh, @iammollymchugh. We’re skeptical that every single Twitter account appears in the directory, but it could be close to listing the full 500 million users. We’ve estimated that under “A,” there are 18 million user names alone. Twitter’s spokesperson cryptically hinted that not every account may appear in the directory. “Similar to search results, we have methods to filter for quality accounts.” The spokesperson then directed me to Twitter’s Help Center to read the requirements for a user to show up in Twitter’s search results. Basically, it says the directory will only list what Twitter deems “quality accounts” — a determination that’s reminiscent of how Twitter hands over Verified Account badges. Accounts that don’t meet Twitter’s expectations per “Twitter’s Search Rules and Restrictions” could be penalized by being excluded from the directory. While how Twitter decides who gets to be in the directory is interesting, what really matters here is how effective its efforts at getting indexed by search engines are. When we conducted a Google search to find out how many accounts were indexed from Twitter’s directory using the query site:twitter.com/i/directory/profiles, as SearchEngineLand (which noticed the directory roll out) had done, we found that just a mere 618,000 Twitter accounts had been indexed (fewer than SearchEngineLand found earlier this week). At last check, this number had risen to 644,000 results, which indicates Google is continuing to index them. Bing on the other hand has yet to index Twitter’s directory and returns just one result. DuckDuckGo offers just two results. 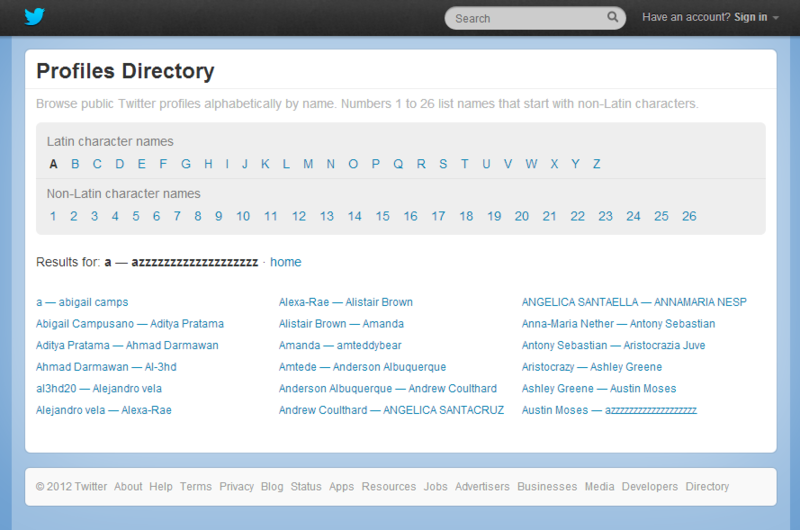 Is Twitter’s directory necessarily helping to crawl more Twitter accounts? Not yet at least; the directory doesn’t appear to make much of a dent on Google’s search algorithm when accounting for the fact that just 0.0012 percent of Twitter’s directory of 500 million accounts are being indexed by Google — although that number appears to be rising, albeit very minimally. Neil Patel, co-founder of KISSmetrics and marketing blog Quick Sprout, agrees. “Percentage wise, I don’t think it will cause a huge lift. I would be shocked if it causes their overall traffic to jump by more than 10 or 15 percent,” he says. “When you have millions of Twitter profiles, naturally not all of them will be indexed as good portion of their user profile pages aren’t popular, contain very few tweets, and aren’t linked to from other websites,” Patel explained. Still even a five percent increase would result in millions more visitors, Patel adds, the idea being this respectively boosts Twitter’s ad revenue. As Twitter tightens its grip on its ecosystem, motivated by its renewed focus on advertising, the directory should improve Twitter’s search visibility — even if just by fractions. The better the company’s search presence on Google, Bing, or any other search engine, the more traffic it will bring in. And of course higher traffic means more ad revenue. So even if that increase is minute, it’s existent. So what does this mean for everyday users of Google, Bing or other search engines? Twitter has consistently been a source for the freshest information, so “now by making this information available to search engines, Twitter provides helpful on the spot data whereas a page that needs to gain organic rankings would never be able to reach,” say Eng.